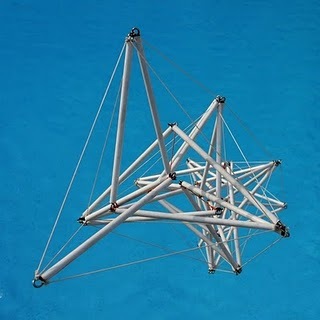 Read here about a v-shaped rigid strut used in tensegrity structures and called the "V-expander." The V-expander refers to the use of a v-shaped rigid strut in a tensegrity structure. The V-expander is an example of non-linear strut. For our purposes, it is a form of a nucleated strut. For more information on strut morphology see Strut, Strut, Curved, Strut, Ring. 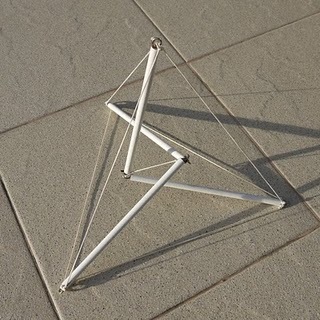 Motro defined the V-Expander in "Tensegrity: structural systems for the future" as follows. The V expander is constituted by two struts, each one converging to a pin jointed node, placed respectively on either grid's flexible layer. The expander's axis, joining this couple of nodes, is normal to the layer's surface. an active cable materializes the expander's axis. By reducing its length, it is tensioned and introduces a pre-stress (self-stress) state. v-expander rendering from "Tensegrity" by Motro fig 7.6 page 194. 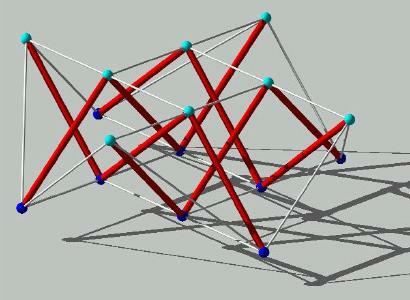 Vinicius Raducanu, who worked on the Tensarch Project at Montpellier, applied this “V-expander” to different geometries: bi-, tri- and quadri-directional tensegrity grids. 4 v-expander, published as Bi-dimensional double-layer grid Laboratoire de Mécanique et Génie Civil by Montpellier. Illustration by Gómez-Jáuregui. Robert Mathieson recently posted to his website helixes composed of v-expander modules. He wrote, "the v-expander module is constructed from four equal length compressive members, six equal length outer tension cables and a central tendon. The center tendon is crucial as it stresses the whole structure, holds the form together and gives it rigidity." Below, 1 v-expander module by Mathieson. Below, a helix composed of repeating v-expander modules. This page was last edited on 3 December 2018, at 16:30.